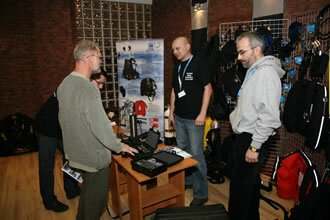 Meet the professional divers to exchange experiences and all the aspects of technical diving. Preparation to the 2008 Technical Conference took almost nine months. It may seem a lot of time, but in fact from the very beginning we knew that this is hardly enough. Each of the organizers has of course his own job, business, family. The main problem was of course inviting international guests. Remember that Poland is still not well recognized on the diving map of the world. Also the costs were of significant importance. We decided to invite four divers from among absolute top technical divers: Nick Touissant, Alessandro Fenu, Kevin Gurr, Andrew Georgitsis. From this four we knew only Andrew Georgitsis for whom it was already third trip to Poland. So how to communicate and agree everything with people that we don’t know at all. Well, in fact easier that we believed. It was enough to exchange 2-3 emails and we were all set. As always it turned out that REAL divers are more than willing to share their knowledge and experience with others. Each of the them eagerly agreed to come and make a presentation in the totally unknown place – Jastrzębia Góra. Our goal for this year was to gather 200 divers in one place. The registration process lasting several weeks did not predict the success. Perhaps we did something wrong? Perhaps last year conference did not go as good as we believed. Fortunately it all changed in the last weeks – finally we had 230 registrations which together with organizers and invited guests summed up to 250 participants. The last weeks before the Conference also brought some disappointments. Kevin Gurr informed us that due to the planned surgery (he was given very short notice of the date) he must cancel his trip. As a consolation he sent us a new VR3 computer to be drawn among the participants. Nevertheless it is a pity that we could not have a lecture on rebreathers. Everything was buttoned up. First invited guests started to arrive on Friday around noon (not surprisingly they all had problems with their flights). The winter decided to show its white teeth and traveling to the hotel was not easy. The participants kept arriving until late at night. Those who managed to make it on time had a late dinner and time for integration. Saturday was the first official day of the conference. It begun with Nick Touissant's presentation on the caves of southern France and northern Italy. Not many divers are familiar with these regions. Nick in simple words described the types of caves existing in these areas and their origin, and presented some of them in more detail. Due to time constrains he did not presents his very interesting cave diving projects (well, perhaps next year). Then there was a time for the most difficult and the longest presentation – oxygen and diving. With no doubt Jacek Kot and Zdzisław Śicko know how to keep alert and maintain the contact with the audience – for sure they are both world class lecturers. 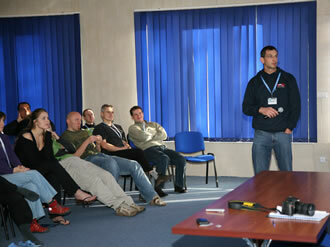 The lecture on technical aspects of oxygen in diving was surprising for many of the participants. It was immediately followed by Michał Kosuth's lecture on equipment for oxygen first aid. He clearly explained why it is so important to have such equipment at hand and to know how to use is, and when. Michał is the man who really knows what he is talking about. The oxygen session was closed by the brief presentation of P. Górlaczyk and E.Lizak on first aid in diving accidents and new resuscitation rules. It was a solid portion of knowledge that everyone should have. During a long break the participants had a chance to see technical novelties displayed by the manufacturers and distributors of diving equipment. This year the conference attracted almost 20 of them. Those not interested in diving gear could participate in practical CPR and oxygen first aid workshops. After the brake Alessandro Fenu showed everyone what is a DPV. Many divers still treat a scooter as an extravagant toy, and those who want to have one don’t know which one to buy. Allesandro in simple terms told us what scooters are used and available on the market, how to choose one, and how to make the best use of it. Simple? Maybe, at least for another 170 persons who now how to pick the right scooter for their needs. Allessandro ended his presentation by showing video from DPV courses to prove why scootering is such a fun. 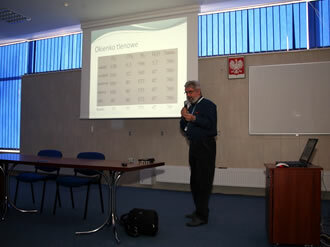 After the DPV session Tomek Stachura and Sebastian Popek had a presentation on the latest Baltic wreck projects. Sebastian showed the pictures and told us about the XIX century wooden sail ship wreck found in June near Hel Pennisula and later, about the expedition to the II WW Wreck of Bremenhaven . As usual it was followed by the discussion on dive permissions and rights to the wreck. Well, at least we know now that people were listening. Then Tomek presented a project organized from Sweden in which he had a chance to participate – first dives to the Seahorse, dream wreck of all wreck divers. Seahorse is a XV century sailboat resting in one piece 105 meters below the surface. Tomek was among the first divers on the wreck – first people to see it after more than 600 years. This fantastic story ended the first day of presentations. Fortunately it was not all for that day. The raffle for participants initiated by Kevin Gurr was appreciated by the exhibitors. Almost everyone founded a prize, and believe me, these were not little gadgets. Those participants who filled in the questionnaire participated in the raffle, and the winners were more than happy. The dinner was followed by the diving movies night – yes the movie from the Seahorse wreck was also shown. Sudany was a wreck day. It begun with Andrew Georgitsis presentation on his project in Lebanon and dives on the famous Victoria wreck. As always he was answering all the questions with a large sense of humor, sometimes putting the author of the questions of their stroke. The last point on the agenda was Adam Olejnik's presentation on Using of ROV for wreck searching and identification. Adam Olejnik contributed to identification of such wrecks as Steuben or Graff Zeppelin, so he had something to tell but also to show. Two days passed quickly. Unfortunately we did not manage to talk with the majority of participants although last year we promised ourselves that we will try . As before, we listened to all comments and suggestions for the next year conference. We are now reassured that as with each such event, the presentations may be interesting, the lectures the best but the overall success of the conference depends on the atmosphere created by the participants, You all did well – thank you. What about the plans for next year? First we need to rest a bit. We have a lot ideas. Perhaps we will finally manage to have a presentation on rebreathers. Or perhaps about deep stops or decompression algorithms. We will see. I hope you all enjoyed the conference and hope to see you, and many new participants next year. Copyright © 2019 www.konferencjatechniczna.pl All rights reserved.